Description: Harmless. Smooth shiny scales. 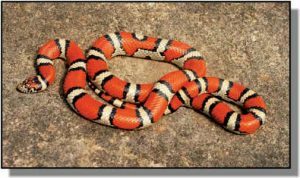 In eastern Kansas, body is cream or light gray covered with wide red blotches outlined in black; these same blotches are orange-red separated by a white, light gray or cream background color in the western half of Kansas. Head usually red or orange with black markings; belly with checkerboard pattern of dark and light. Young are patterned like adults, but colors are brighter. Habits: Found under rocks and logs in forests, woodland edge, pastures and rocky ledges of western Kansas; takes refuge beneath any available cover, particularly bark of rotten logs and other debris. Active from March to October. Breeds in spring; lays from 3-24 eggs that hatch in July, August or September. Constrictor. Eats lizards, smaller snakes and small rodents.